BULUXE 304 stainless steel soap dish bathroom saver holder.Modern design meets modern technology with a clean and simple look,easy to install. Are you looking for a high quality 304 stainless steel coat hanger bathroom robe hook to hang your cloths, trousers, keys, towels, aprons and puppy leashes and other items on this hook. BULUXE Products has the solution for you! ★Premium Quality:BULUXE coat hanger bathroom robe hook has a modern look and is made with 304 Solid Stainless Steel so it is with good resistance and resistant to corrosion. ★Eco-Friendly:It is made of high quality environmental protection material, durable, fine workmanship and good surface finishing. ★Easy to use:The thick fixed base and sufficient material will make it more rugged, able to withstand a lot of weight, safe and easy to use. ★Satisfaction Guaranteed:Your satisfaction guaranteed is our policy.We pay attention to every details of products to give you a better using experience. ⚠Purchase our BULUXE robe hook risk-free, backed by our manufacturer 30 days money back guarantee with 5 year warranty. ⚠If you have any questions, please contact us and we are very glad to serve you. 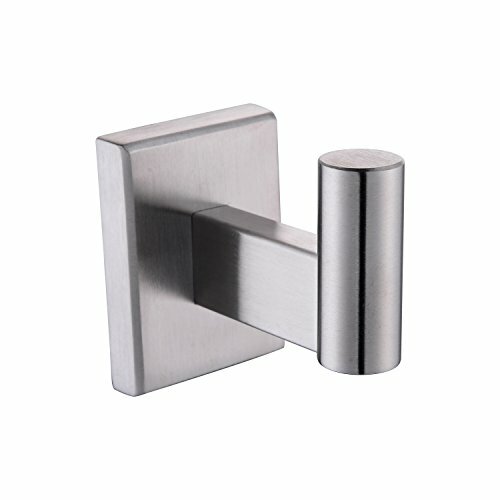 ✅【Product Introductions】304 stainless steel with a brushed nickel modern look, concealed screws design. ✅【Various Uses】Suitable for use in bedrooms, bathrooms, and closets, update your rooms with clean and simple minimalist styling. ✅【Easy to install】This 304 stainless steel robe hook uses a simple set screw mounting system, reducing confusion and stress during installation.You can install in 5 minutes without professional help. ✅【Ensuring the durability and dependability】This product won't slipping off, mounting hardware included for easy assembly, this hook is also large enough to hold your items in place. ✅【Warranty and Customer Service】We provide you a three-years' warranty.If for any reason you are not satisfied with your purchase you can directly request a FULL REFUND or EXCHANGE.If you have any other question, please feel free to contact us via amazon email and we'll regularly respond with the answer you need within 24 hours. If you have any questions about this product by BULUXE, contact us by completing and submitting the form below. If you are looking for a specif part number, please include it with your message.